With a huge investment in Hamilton like LRT – we know it raises a lot of questions. We’ve done our best to try and answer as many as we can here. If we turn down LRT, will we still get the money? No. The province has made it clear that the $1 billion capital cost is for the approved LRT project only. If we turn down the money, it is returned to the GTHA transit fund to go to the next project on the priority list. What's wrong with just keeping our bus system? Buses are an indispensable part of a city's transit system. However, there is an upper limit to what a city can accomplish in terms of passenger capacity and land use with a bus-only transit system. LRT is higher-order rapid transit that has a much higher passenger capacity and speed than a bus system. The per-passenger cost to operate LRT is significantly lower than for a bus system because each driver can carry many more passengers. LRT is also better at attracting new riders than buses - many people who do not want to ride a bus will choose to ride an LRT vehicle. LRT is quieter, smoother and more comfortable than a bus. It is emission-free at the tailpipe (and most electricity generation in Ontario is non-polluting), so it is cleaner. LRT increases the total transportation capacity of a busy city street in a way that cannot be achieved by squeezing in more vehicle lanes. LRT attracts new private investment in dense, mixed-use transit-oriented developments in a corridor roughly half a kilometre on either side of the line. This new density increases the city's property tax revenue, makes more efficient use of existing infrastructure, and increases the area's potential for innovation and economic growth. Developers like to invest around an LRT line because the public investment is a long-term commitment to the success of the community that reassures private investors. What makes it "rapid" transit instead of just transit? The vehicles run in a dedicated right-of-way so they don't get stuck behind traffic. They have signal priority at intersections. That means the signal will turn green or stay green so the LRT vehicle can proceed through the intersection. Stations are spaced farther apart than bus stops so there are fewer stops along the route. Passengers pre-pay at stations so boarding is faster through multiple entrances when the vehicle arrives. Vehicles will arrive frequently enough that passengers just arrive at the station and take the next vehicle instead of waiting for a schedule. Electric vehicles can accelerate faster and more smoothly than buses. Yes. Modern LRT vehicles are allow low-floor with at-grade boarding right on the curb. People travelling with mobility devices like wheelchairs and scooters can just roll on and roll off. In addition, LRT provides a smoother ride with smoother acceleration and deceleration, so it is easier and more comfortable for people of all abilities to ride, whether sitting or standing. Isn't LRT just a fancy word for streetcars? Modern LRT is as different from the streetcars of the early 20th century as a modern car is from a Ford Model T. Modern LRT vehicles are smooth, fast, accessible, comfortable and reliable. The design and class environmental assessment work will be completed between now and early- to mid-2017. A request for proposals (RFP) will be issued in 2017, and a contract with a build consortium will be signed in early 2018. Construction will start in 2019, and the line will be completed in 2023 or 2024.
Who will own the LRT system? The Ontario Government will own the LRT system. The money is being spent in the City of Hamilton, it is not being given to the City of Hamilton. Will LRT be integrated with local transit? That has always been one of the basic elements of the LRT plan. That integration will entail re-orienting the local transit system to feed more effectively into and leverage LRT (one transportation planner has already proposed a way to improve transit service by leveraging existing resources more effectively) and ensuring seamless transition between bus and LRT service. That will also likely mean a single fare system between the two systems, though the details have not yet been finalized. Where will the LRT line run? Phase 1, which is being implemented currently, will run east-west from McMaster University to Queenston Traffic Circle and north-south from King and James to the West Harbour GO Station and possibly as far as the Waterfront. Where will the line be on the street? The LRT will run on a dedicated right-of-way in the centre lanes, with vehicle lanes on the outside. Will LRT construction affect business along the route? Yes. As with all road construction projects, LRT construction will be noisy and disruptive. The City plans to engage closely with all affected residents, property owners, business owners and other stakeholders along the LRT route before and during construction to mitigate the disruption. One possibility to mitigate disruption is a phased construction in which each segment of roadway is only impacted for a limited amount of time. There will also be opportunities for creative initiatives and events to support businesses through the construction phase. It is also important to remember that the underground infrastructure along the LRT route is quite old and much of it will need to be reconstructed sooner or later. If we do not build LRT, we will still eventually have to go through the disruption of ripping up the corridor and disrupting business - but we will end up going through that disruption without getting an LRT line at the end of it. 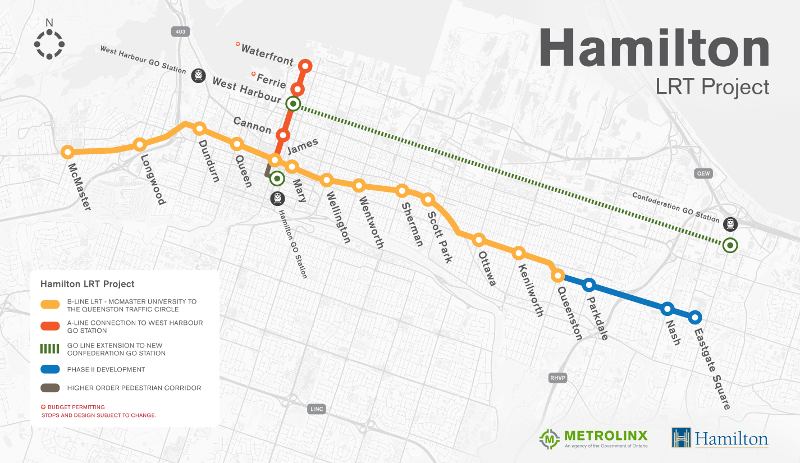 How much will the LRT construction cost Hamilton taxpayers? The entire capital cost is being paid by the Province, so there will be no impact on Hamilton ratepayers. Of course, Hamiltonians also pay provincial income tax and other provincial taxes and fees, but the cost of LRT is being distributed among every taxpayer in Ontario. Will Hamilton taxpayers have to pay anything? Road and underground infrastructure that is already scheduled for replacement in the City's capital budget will have to be paid by the city, but infrastructure that is being replaced due to LRT construction will be paid by Metrolinx. Metrolinx has indicated that they will replace infrastructure on a "like-for-like" basis, meaning the new infrastructure will match the old infrastructure in specifications. If the City decides to install higher capacity infrastructure, it will have to pay the difference in cost. That cost, in turn, may be eligible to be recovered through development charges. I don't live in the lower city and will never use LRT. What's in it for me? As a ratepayer you will benefit from a city that is bringing in more property tax revenue from properties that are currently low-value. As the economy improves and diversifies, you may find more employment opportunities in the city. The buses that LRT replaces can be redeployed to improve service in other parts of the city. This is just phase 1 of the city's long-term rapid transit plan. A successful implementation gets the city a step closer to rapid transit on the north-south A-Line and other proposed rapid transit routes across the mountain and suburbs. In addition, the construction phase will provide up to five years of well-paying construction jobs for Hamiltonians. As well, Metrolinx has promised to work with community organizations on "social procurement", which means taking social benefits into consideration when making hiring, purchasing and procurement decisions. On the Eglinton Crosstown LRT project, that has meant local employment, apprenticeship and supplier opportunities for people living in Toronto. Still can’t find an answer to your question? Reach out to us at info@yeslrt.ca and we’ll do our best to help answer it!